A female guitar prodigy, at fourteen Chantel was told by major labels that she had a "great voice, but girls don't play guitar like that!" Wisely ignoring the comments, she enrolled at the Leeds College of Music and became the first student in the college’s history, to achieve a 100% pass mark, with 18 distinctions. Chantel left with a First Class Honours degree in Popular Music and a coveted prize, the college’s musician of the year award. 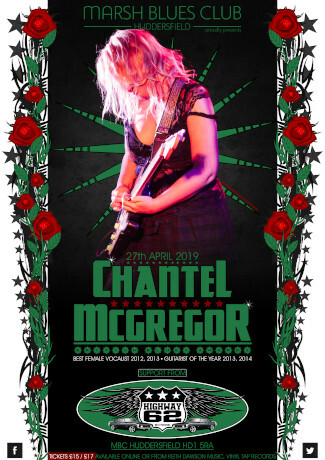 In previous years, Chantel stepped out in the pro-musician world and her stunning live performances demonstrated that she had the ability to perform rock for the new age, played by a musician born with an effortless virtuosity. Since then, she has built a loyal and growing fan base who follow her every move. When Chantel released her 2011 debut album, Like No Other, one critic said, “Chantel McGregor deserves to be held up as a messiah of blues-rock and given her own mountain. She doesn't strum or pick her guitar but almost bends and distorts it, as if she's channelling the ghost of Hendrix through her fingers"
Chantel is currently writing for her third album, debuting some of the new tracks on her 2018 tour which is currently taking place throughout the UK and Europe. Highway 62 are an exciting and dynamic rock, pop and blues covers band from West Yorkshire. With a talented line up of experienced musicians including bass, drums, two guitars and keys, the band also has a female lead vocalist. The band has a wide repertoire and a reputation for getting your audiences dancing, singing and shouting along. If you want energy, fantastic music and a great time then don't miss this band! Doors 7.30pm. First band on stage at 8pm. Late bar serving real ale, lagers, fine wines, spirits etc at club prices. Plenty of free on-site parking. Tickets go on sale 1st December. Older children welcome (accompanied) at parent's discretion.